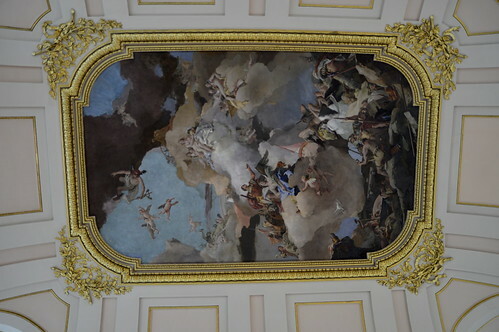 Today another post about lovely Madrid! 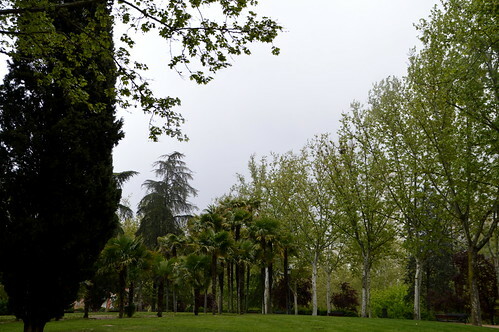 I will tell you a bit more about our visit to the Palacio Real and Templo de Debod. For Sunday they predicted really bad weather: cold, rain, wind,… the lot! So we decided to do some things inside to keep ourselves as warm and dry as possible. In the morning we did our tour of the stadium Santiago Bernabéu (as you could see in this post). 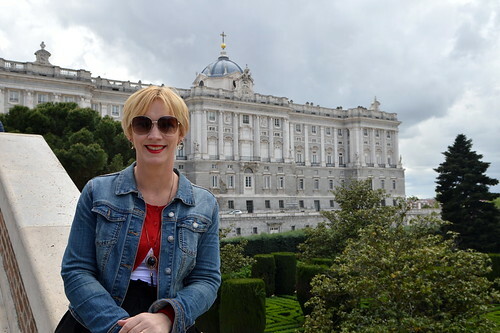 After our very lovely lunch at Real Café, we took the underground to Plaza de Espana, which is near the Royal Palace that we would visit in the afternoon. 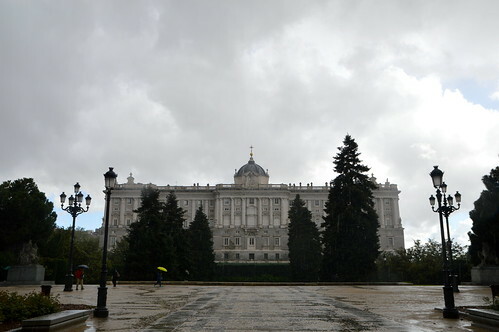 When we came out of the metro, the heavens opened up big time, treating us to heavy rain and even hail… but that didn’t stop us from walking towards the Palacio Real. As soon as we joined the queue to the ticket office, it stopped raining and hailing and the heavens opened up. Now that’s the best part I like about rain and hail… the heavens opening up after it. 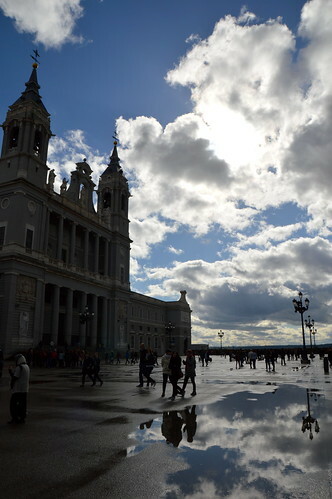 And not only because we could put away our umbrella, but the light was so beautiful then to take pictures! We were treated to such lovely blue skies and the clouds were just beauties… amazing 🙂 It made the queueing a bit more bearable I must say! The queueing became a bit (!) more bearable when the sun broke out! Yip… she’s bigger than I am… and so proud of it!!! 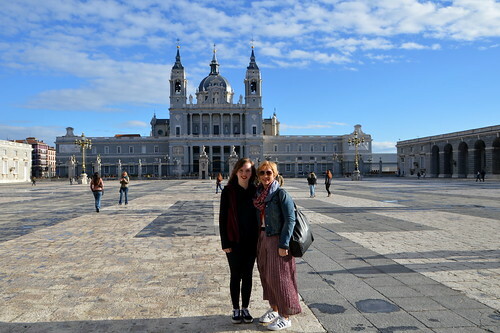 Here we stand on the palace’s courtyard, with the stunning Almudena Cathedral behind us. 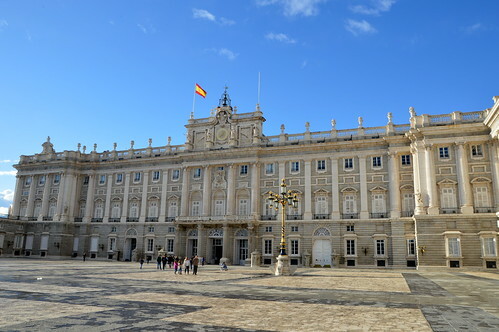 The Palacio Real is the offical residence of the Spanish royal family, but it actually is only used for state ceremonies. 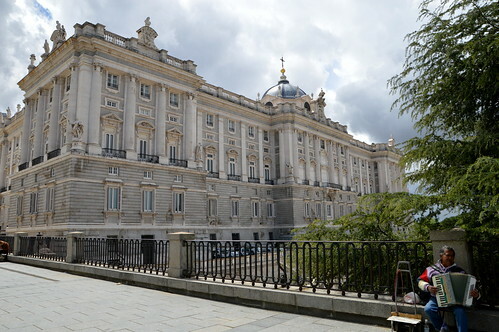 We just visited the palace and not the kitchens as we didn’t have the time to fit that all in. 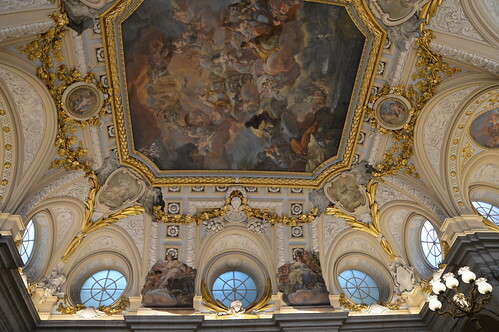 However, I have heard that the kitchens are quite spectacular. 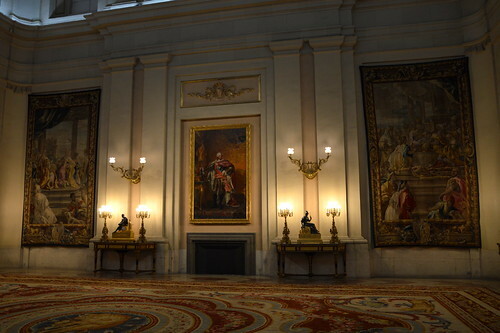 So if you are interested in a visit, make sure to tell so at the entrance as a different entrance fee applies for visiting palace ànd kitchen. 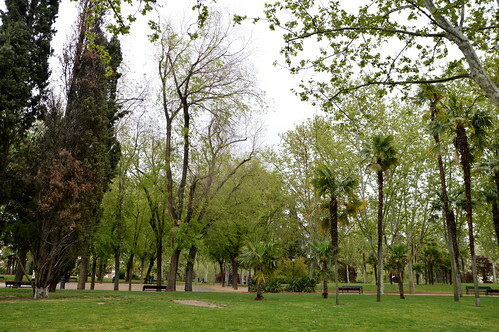 And don’t forget the gardens. 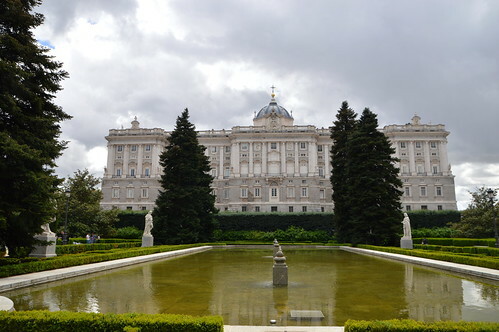 On the day of our visit to the palace, we just rushed through the gardens because of the hail. The day after however, we took a bit more time. They’re definitely worth a little stroll. If you don’t visit the palace, then do however include a little walk in the gardens as they offer some splendid views towards the palace! On the website you can find all the information needed for your visit. 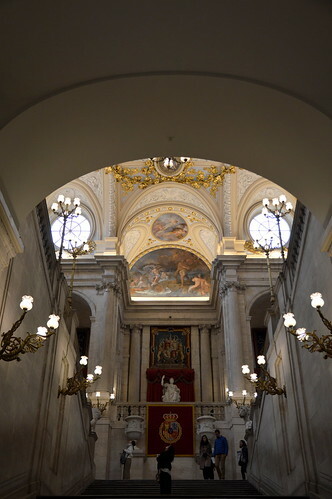 Make sure to check whether the palace is open on the day of your visit! 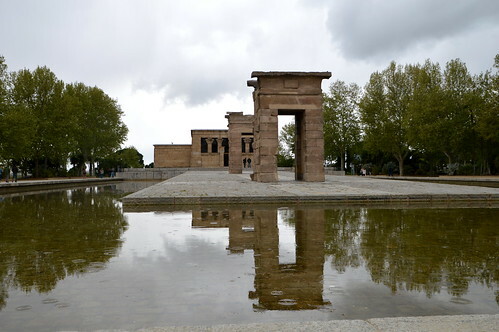 A 15 minute walk from the Palacio Real you can find the Templo de Debod. 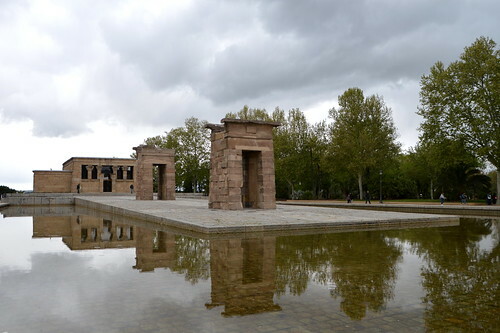 This is an actual Egyptian temple from the 2nd century BC. 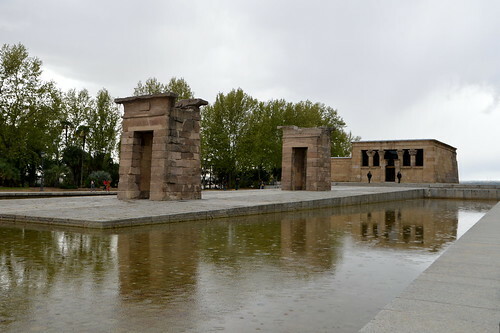 The temple was donated to Spain by the Egyptian government as a thank you present to save Egypt from floods after the building of the Aswan Dam. 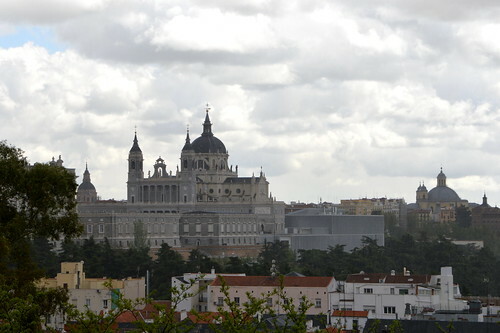 The reconstruction in Madrid kept the building’s original orientation: from East to West. The inside is currently closed, but the site is worth a visit. During our visit however, it started raining again, so we quickly went around the site taking some pictures and heading back into the centre to find something to eat. I bet on a beautiful and clear day, it would be a perfect place to hang out for a while! 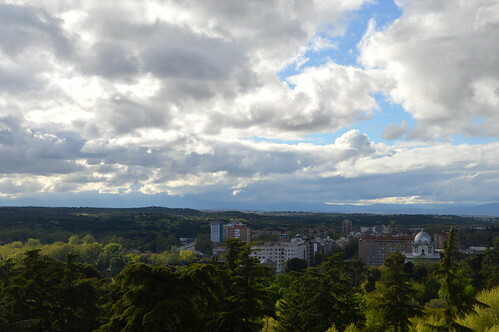 Pity about the weather, but those clouds certainly added some drama to the view from Templo de Debod towards the Palace and Cathedral! 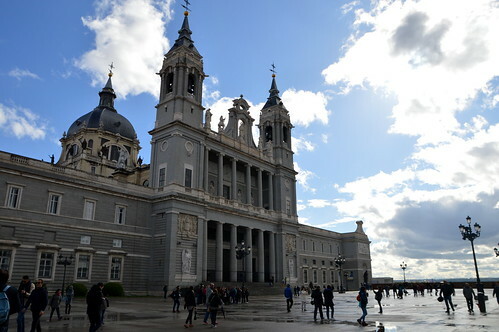 These two landmarks are definitely worth a bit of your time in Madrid: the palace because of it’s splendid interior, the temple because of its quirkiness and its views… put them on your Madrid to do list I’d say! 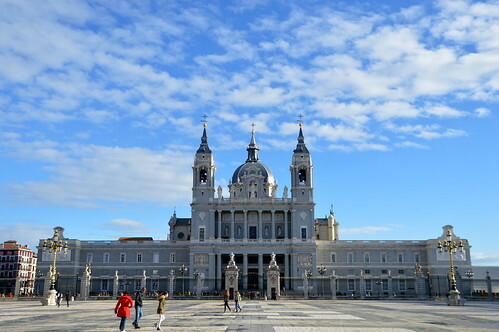 This entry was posted in Spain, Travel and tagged madrid, palacio real, Spain, templo de debod.